You ever had those experiences which are not easy for you to handle? You keep trying for better results but fails every time? If you have to face such those situations than you will know how hard is it to forget them and move one. 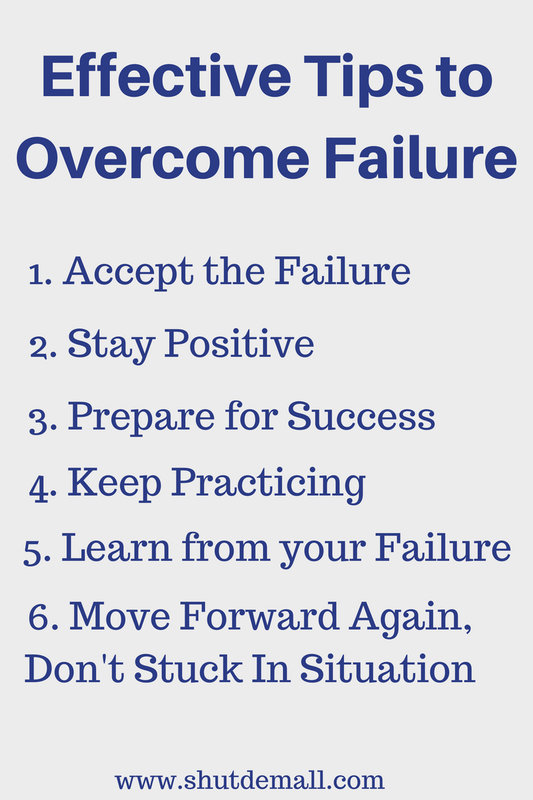 Today in this article I will give you some tips which will help you to move on from your failure and will lead you to a better and happy life. Before getting started let me tell you the story of a man whom you know, but story you don’t. Sandeep Maheshwari the CEO of Images Bazaar. We all know that how successful he is. But did you know how he has become so successful in his life? He fails much time in his life. If just stop there and crying about failure, he would never be so much success in life. Here is the inspirational life story of Sandeep Maheshwari which will help you to know how failure helps you to become successful. Sandeep was born on 28th September 1980. He belongs to a middle-class family. When he was a child his father has a business of aluminum. But unfortunately, he leaves that business due to some circumstances. At that time, his father didn’t have any job or any work to make some money. As per the time passes, his parents do many efforts to make money. They started many businesses, but every time fails. When he reaches 12th standard his mindset upon on this thought that he had to do something. It’s not his parents saying him to do some work, it’s his choice, his own decisions. At that time, his family had a very bad time. They almost lost all their hopes, because none of their work was doing well. After Sandeep complete his 12th standard, the turning point came into his life. Sandeep was so amazed, that how can a 21 years boy makes that amount of money in life. He feels very motivated by his words. That was the day when Sandeep realize that he can also become successful. After that day, changes come into his life. All his family members start saying that he has gone mad. But he didn’t listen to them. Then he chooses a career to become a model. He started doing modeling in his college. But then he sees that it is not he is alone who is doing modeling, there were thousands of other people. Then Sandeep notices that at that time half of the modeling agencies who say they will provide job to models were fake, they were spams and lying to peoples. Then a desire came into Sandeep mind’s, to do something for the struggler models. He didn’t have any idea what to do but he just has a desire at that time. Then one of his friends came to him and show him his portfolio that he just shoots from a professional photographer. Then Sandeep was so excited and amazed by that picture. There comes a change in his mind. After that, he wanted to be a photographer. He goes to many schools, agencies, and just tell them that he just wanted to learn photography. In the end, he joins a photography course of two weeks in South Delhi. After that, he bought a new camera and start clicking pictures. He shoots many pictures a day just in the hope that he would become a professional photographer. But then he saw that there are many other photographers who are not getting any money. But there is a difference between Sandeep and other photographers. Before coming into photography field Sandeep was a struggler model and he knows what a model feels when he fails. He knows their feelings, their emotions. He saw his career in the perspective of a model instead of a photographer. He makes a list of all the genuine agency and all the fake, spam agencies. And started telling peoples that, these are frauds and these are real. Sandeep believes that whatever you do, do that with the truth. Sandeep started a free photoshoot for all the struggler models. He just charged of his camera roles and prints. He makes his first ad of 4800Rs. and that was his first success in life by which he makes 25000Rs. At 2003, a stage comes when he just stuck there. He shoots model, but when the model shows their portfolio to the modeling agencies they just rejected them, because Sandeep was not a famous photographer. No one knows him at that time. Then Sandeep realizes he must do something for it. He should make his name in front of the world. So, he went Limca Book of Records and meet their MD Vijaya Ghose. She said that he should shoot at least 10000 different roles in 12 hours. He started calling all those models who didn’t have enough money for their portfolio and Sandeep says them he will shoot their portfolio in just 500Rs. He makes the world record in just 11 hours. This is how he makes his name in front of the world. But after some time, he quit photography and join a multi-level company named as Japan Life. A stage comes at that time when he was earning almost 1 lakhs per month. But he was not satisfied with that. He started his own company with the help of some of his other co-workers. In almost 6 months, the company grows but at the end, Sandeep didn’t get anything because of some partnership agreements. So, when the company ends, he again comes to zero. At that time, all were saying to him that he is just stupid. He is so innocent. After almost 7 years, he made his website images Bazar. Sandeep belongs to a photography background but he would not have any knowledge of software development and programming. Because of the company they made Images Bazaar was made. Because Sandeep makes all the software’s and does all the programming of that company. If he doesn’t make that company, images bazar could never be made. Sandeep also wrote a book on Marketing. He publishes his book. He again fails in that. What Sandeep has now become, is just because of that book. This is because in the making of that book he read many other books and gains so much knowledge. Now comes to the most important part of his life. That made him successful in his life. He made to reach his company (Images Bazar) at that point when their agency was the leading firm in Delhi. As like other agencies they didn’t say that they will surely provide models work. they just say the truth that all didn’t get work, it is dependent on you. But Sandeep was still not satisfied with that. He earns a decent amount of money but still not happy. Because the models were not happy. Models were not happy because they didn’t get any work. Then Sandeep again feels a desire of doing something for models. One day, a man from an advertisement agency comes to him and said that he didn’t have enough time to shoot. They just wanted a pre-prepared shoot that they can just publish in their advertisements. They charged Sandeep 2500Rs for that shoot. Sandeep gives 1250Rs. Out of that money to the model. After that incident, an idea comes to Sandeep minds. He closes his offices and put all his focus on images Bazar. That day Sandeep promise that they would not demand any money from the model. And thus, the Images Bazar becomes successful and a turning point in Sandeep’s life. This is the first thing you must do. If you didn’t accept your failure, you can’t overcome it. Accept the failure, it is the bitter truth that you should accept. Did you know that some people can’t just accept the failure because of their ego? Believe me, it is not the presence of mind, it is not smartness. It is their foolishness. Accepting the failure doesn’t mean that you are not good. It doesn’t mean that you are not smart enough to do that work. It simply means you are not prepared yet. It means that you have done something wrong. Try to figure that out, what you do wrong and next time, you will succeed. If you failed at something, don’t stop. Accept the failure and see that why you fail in that. When you find your mistakes, try to improve them. This is the only way to success. Always remember great things take time to happen. Positivity matters a lot in one’s life. Positivity means find something good in a worse situation. If you stay positive in life, you will never regret anything. It is an art of living. Positivity helps one to stay motivated, to stay inspired. Everything happens for a reason. And everything has something positive in that. It depends on us, what we see. It is our choice whether to choose devil or angel. Whether to choose good or evil. Positivity is simply a thought that helps us to never get down. It tells us to always move. It tells us that everything going to be alright. If you don’t know how to stay positive in life. you can read this. These effective ways to stay positive will surely help you. Don’t worry if you fail today. It may be you are not yet fully prepared for that. Find out the mistakes and try to improve them. No one is perfect in this world. Everyone made mistakes. But it depends on us, how we treat our failure. Whether we quit or improve ourselves for success. If one hasn’t yet failed in something, then he has never done something new. No one born perfect. One must make their self-perfect. Become an expert or successful in one field takes time. It is not an overnight work. You must become consistent toward your work. It is not only the hard work that is the key to success. Consistency is also the key to success. Practice doesn’t have any glory, but without practice, there is no glory. Remember it always. You can’t just be perfect in one work or field without any practice. Practicing requires time. It requires hard work. It demands consistency. And the most important it demands your 100%. Try to give your best in learning, in practice. It is the only way that makes you expert and let you overcome your failure. I see many peoples who quit their work just because they fail. Are you too one of them who quit their work just because you fail once. Did you know that masters have tried more than that the student even failed? To become master, you must look at the failures and focus on your goal. Success is a long-term goal it can’t be achieved in one day or one night. Failure is a lesson which helps you to know your power and your ability in life. It doesn’t mean that you can’t do it. It means you can do it, but you need practice. Don’t be regret if you failed in something. Be thankful that you learn something new from that failure. The one who doesn’t stop on failure is the one who made their dreams true. Failures, bad experiences all are just a part of life which are there just to make you learn something new. It all depends on your perspective view. If you saw the failure as an end, you will never be successful in life. But if you saw the failure as a new thing that you can learn, believe me, you will surely succeed in life. You just need patience, hard work, and consistent mind. This is called the way of living. No matter you failed once. No matter you failed twice. If you just stuck to one situation you could never reach your destiny. So, you must move forward, look beyond the failures and focus on your aim. Procession the situation and accepting it inessential. All small failures help you to achieve a great big achievement. The Secrets of Successful Peoples: How they Achieve their Dreams? Amazing Post sir. Thank you so much. Your welcome Mohd Salman and thanks to you too. It feels so nice to know that people are really enjoying my posts.